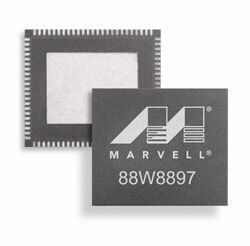 Marvell recently announced its combination, multi-function chip to support 802.11 WiFi, Near Field Communications (NFC) and Bluetooth. The “Marvell Avastar 88W8897” is intended for the hand-held and mobile market. However, this is a full-featured device with plenty of processing power which scales for routers, gateways or fixed node architectures. This is a 2×2 antenna configuration which should support a 900 Mb/s data rate. Going up against the Broadcom solutions, Marvell is looking at a 75% BOM cost reduction and a 40% board real-estate savings by integrating all functions into a single chip. The dual-band 2.4 GHz / 5 GHz device was designed for low-power operation while still supporting the Always On, Always Connected (AOAC) wireless mode required for consumer electronics. Pairing this will 2 antennas to implement transmit beam-forming and a system will have capabilities for the upcoming WiFi certified Miracast™ specification for point to point HD video streaming. Key for this technology is the simultaneous and independent operation of the various wireless protocols. Whether using just 802.11a/c or Bluetooth or NFC, or any combination of the three, there will be no interruption of the data flow through the device. This is especially critical as the user experience grows to include a Bluetooth phone conversation while watching a streaming video and paying for a coffee using a digital wallet (for more information, please see related articles on What’s In Your Digital Wallet? and Near Field Communications (NFC) Background and Standards ).